1. Make a slit on surface of each chicken. 2. 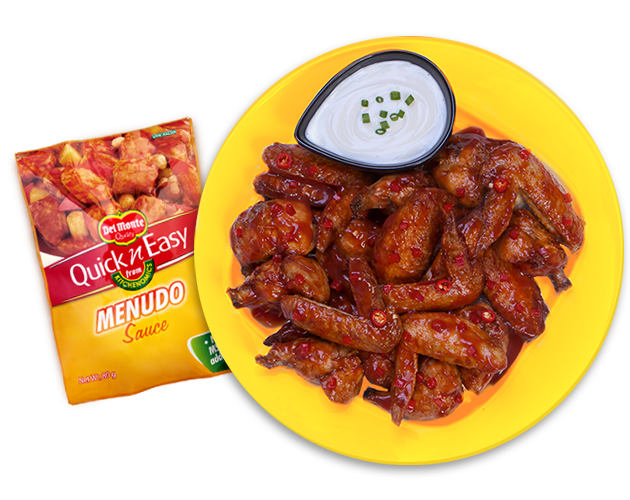 Mix with half of DEL MONTE Quick n Easy Menudo Sauce. 3. Mix it well, don't be afraid to use your hands. They're actually the best mixing tool! 4. Cover with a cling wrap let is stand for 15 minutes in the refrigerator. 5. Season chicken with ½ tsp fine salt and 1/8 tsp pepper. 6. Deep-fry until just cooked (golden brown). Set aside. 7. Sauté garlic and bell pepper in butter for 2 minutes. 8. Add honey or brown sugar and sliced sili and then stir. 9. Add remaining menudo sauce and ¼ cup water. 10. Cover and simmer for 5 minutes, stirring occasionally. 11. Add the fried chicken to the mixture. 12. Cook over low heat while stirring for 2-3 minutes or until chicken pcs are coated with sauce. 13. Serve with sour cream if desired.